I have news! 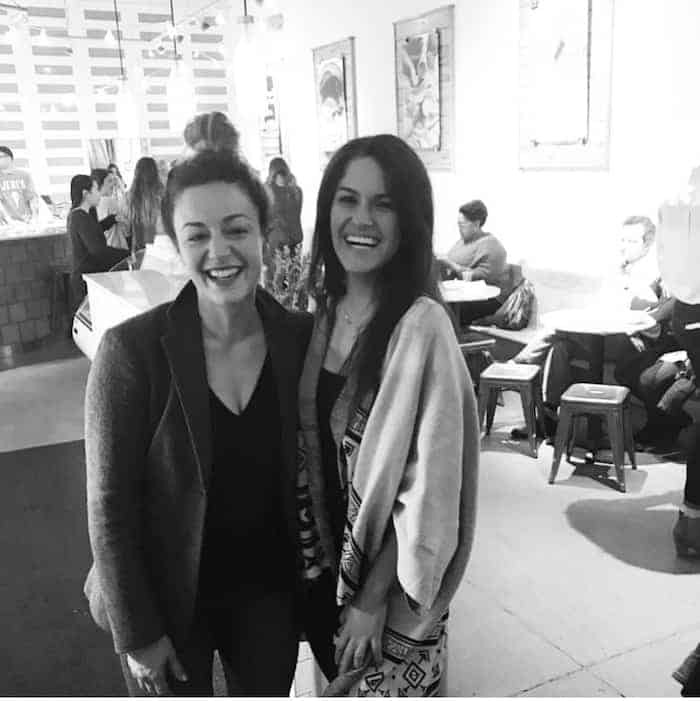 First, my dear friend Simi just released her first book and you NEED it. Letting Go of Leo will make you cry tears of laughter on one page and sadness the next. Simi is infectiously authentic and insanely relatable. Her ability to challenge the diet world’s status quo without putting anyone down is a true gift to womanhood. Her book weaves together hilariously touching stories of her life, equally soulful and silly ones that ultimately brought her to the perfectly imperfect place of peace where she stands today. She turns heartbreak, doubt, body shame, self-loathing, the endless quest for acceptance, and the need to control into valuable lessons learned. Simi reminds me time and time again that life is a journey, not a destination. That we teach what we want to learn and that we are all capable of loving and being loved. This book is as overflowing with heart and soul as the author. Get yo’self a copy! I’m also reading Braving the Wilderness and Call Me By Your Name. What are you reading right now? Second, our renovation was featured on Apartment Therapy! Totally made my day. Onto the fooooood! Pancakes always happen at least once a week. I used my old Fluffy Greek Yogurt Pancakes recipe and I’m thinking they need an update and a re-post. Who’s with me? 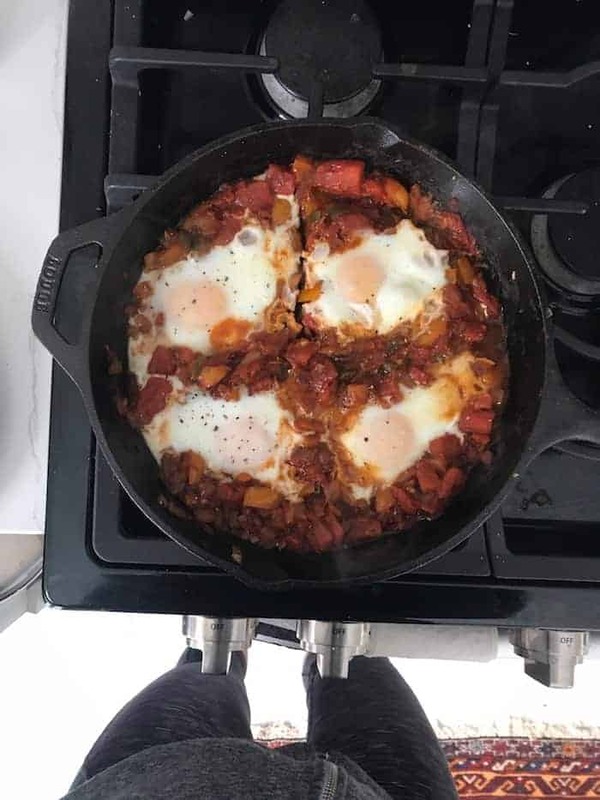 Shakshuka!! Yep, I finally posted the recipe. Joy to the world! I found the cutest little purple potatoes at Kroger to have on the side. 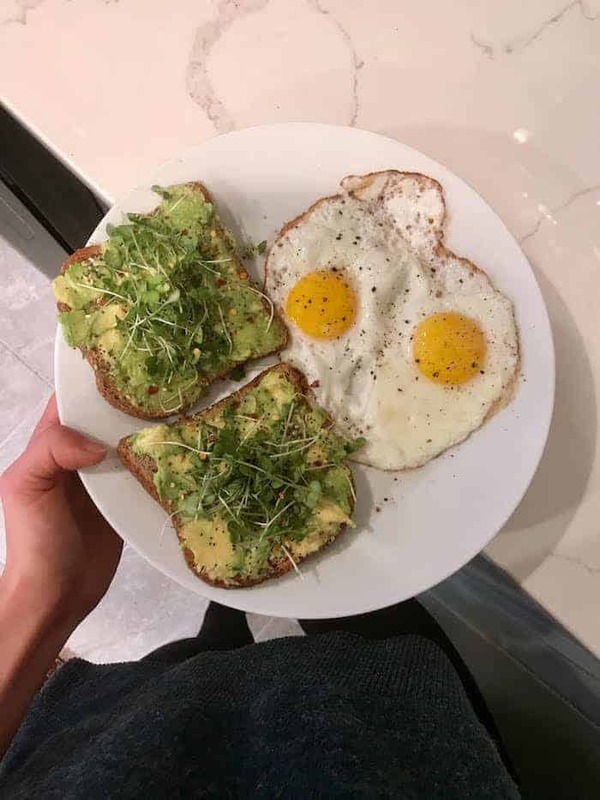 Organic eggs and avocado toast (loving Trader Joe’s sprouted wheat berry bread) with everything bagel seasoning, red pepper flakes, and lemon juice. Guys…I’m obsessed with lemon on avocado toast. I keep a jar of bottled lemon juice in the fridge at all times and put it on like, everything. 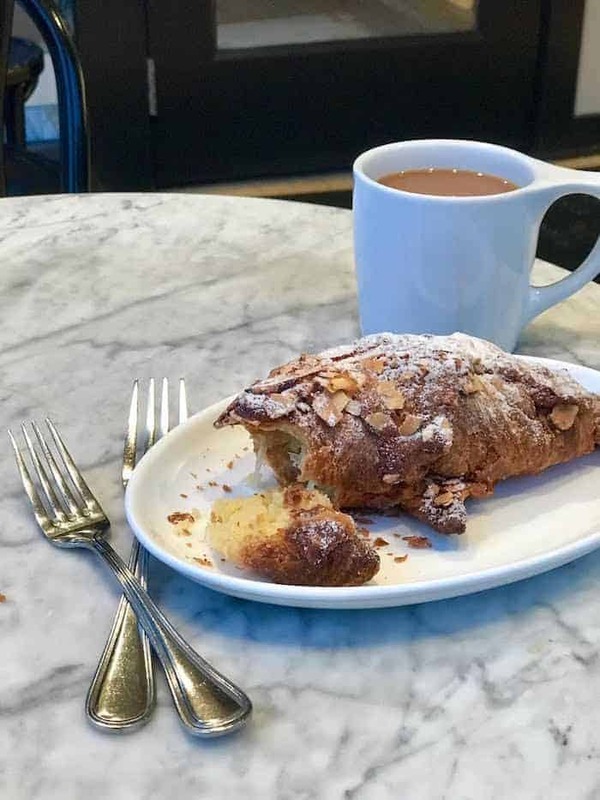 Almond croissant (my absolute favorite pastry) from Pistacia Vera + coffee. 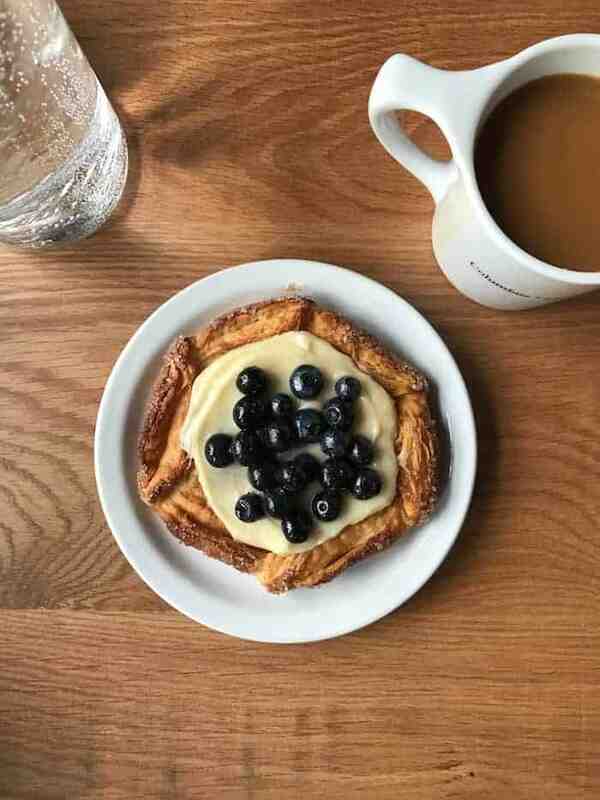 I remember the days when a pastry would never count as “legitimate” breakfast because it wasn’t full of whole grains or green. I’m so glad those times are behind me. 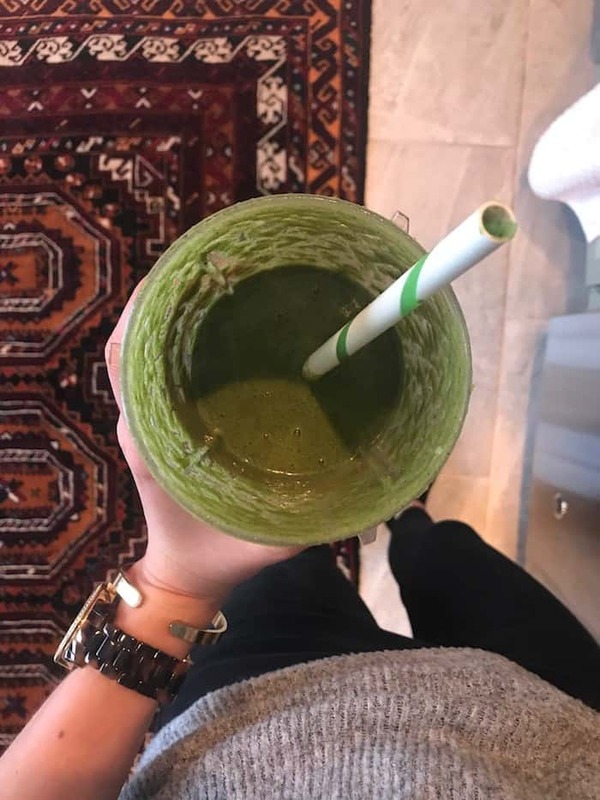 A green smoothie with frozen pineapple, frozen zucchini, frozen cauliflower, kale, orange, hemp seeds, peanut butter, ginger, and spirulina. An egg sandwich that I inhaled before taking the picture + a blueberry galette I split with my girlfriend at the the Fox in the Snow in German Village. African Peanut Soup from The Oh She Glows Cookbook topped with peanuts and cilantro. I used a can of lentils and added leftover cabbage I had in the fridge. SO good! Southwestern sweet potato corn chowder from Alchemy. A big salad with squash, beets, and nuts from The Market (kind of more like a snack). The best lasagna!! I used lentil noodles and an entire 40oz jar of Rao’s sauce that I got at Costco. We had garlic bread and salad on the side. Our new Tropical Storm smoothie bowl from Alchemy. No-Bake Mint Chocolate Protein Bars. The yummiest peanut butter cookie dough bites covered in melted chocolate chips + coconut oil. I gotta post the recipe soon! 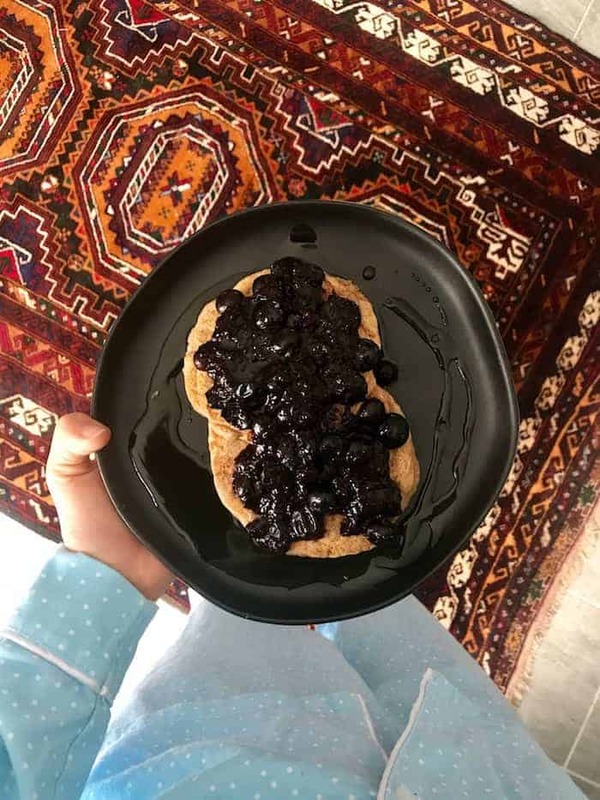 Can we talk about how plump and juicy those blueberries look in both those meals? My god, I want them now!! Can’t wait for the bites recipe– those look heavenly! Is there anything better than a perfect bloob?! Looks like a super delicious week! It was one to remember! Good eats make me so HAPPY. Treat yourself to something yummy this week! Simi’s Book seems like something everyone can relate to! I’m currently reading Love Does, but this sounds like such a great book to read next! Doesn’t that quote just make your heart soar?! Wish we could talk life and this book over pastries! I love how much variety you include in your days and weeks! I also love how not everything is perfectly plated or “Ig-worthy” – I do love real life photos a ton. :) Amen to not every meal or snack being “nutritionally perfect” but instead, focusing on nourishment AND satisfaction. I so need to have some of those peanut butter dough chocolate bites. They look sooo good! Thanks dear!! Learning to live in the gray area of health and wellness has been the best journey. I already checked out her book and have added it to my new intuitive eating Book Club list! I’m getting ready to reread Intuitive Eating with the launch of the Book Club. I also follow along with Emma Watson’s book club, Our Shared Shelf, and am finishing up The Power right now. Love all kinds of female empowerment books! Hellooo most empowering bookclub. Sounds like a group of boss babes! BAGEL SEASONING IS EVERYTHING. The avocado toast options are endless! I’ll have to get the cookie dough bite recipe out for you because they’re legit to die for!! There’s no snack like a muffin snack!! Food twins foreva. The best part!! So good on oatmeal too. Just microwaved berries with some chia sprinkled in to thicken it up! That gallette and that croissant look sooo flakey! I’ve been craving one for a while and this weekend I have it on my agenda to try out new cafe to treat myself while I do work. I’m thinking I’m gonna make it a weekly thing to make getting homework done on the weekend more fun. I used to worry about non-whole grains and sugar too but that’s sooo last year ;) . Food freedom is where it’s at. Nothing would motivate me to do homework like a pastry! Food freedom is so FUN.